Word of mouth marketing: While consumers are unlikely to talk to all their friends about an unremarkable trip to the shops, cool in-store experiences can help create a buzz around your brand to spread the word. User-generated content: Linked to the above, creating designated hashtags and encouraging consumers to share their experiences on social can provide brands with a wealth of user-generated content that can further be used in their marketing campaigns. In-store footfall: While direct selling may not be the name of the game, the additional footfall created by in-store events can have a knock on effect on sales. Customer data: Offline events give brands the unique opportunity to look beyond a customer’s transactional data and get to know them more as people. All of this information can subsequently be used to send more interesting, tailored content. For example, a womenswear brand might host an in-store yoga workshop; after the event, the marketer could use attendee data to both enrich these customers' profiles (that they're interested in yoga, for example) but also create tailored follow-up marketing campaigns to encourage purchasing afterwards (a dedicated yoga-themed mailout with a special offer, for example). And so, without further ado, here are six brands hosting awesome in-store experiences. From expert consultations to yoga classes to free nail art, Topshop is basically an events-based-marketing goddess in the retail world (and therefore a great place to kick off this list). Looking specifically at its iconic HQ in London, at the start of summer the store played host to a gigantic, looping water slide that, through the powers of virtual reality (VR), took participants on a digital rollercoaster through Oxford Street. Aside from sounding really fun (and probably keeping shoppers in-store a lot longer than anticipated) the slide also managed to generate conversation on social through the hashtag #TopshopSplash, as well as a special Snapchat filter. Topshop also set up a photo-shoot at the end of the flume downstairs, as well as offering other cool in-store experiences to mark the start of summer, such as ice cream and hair tutorials. According to the brand’s global marketing and communications director, Sheena Sauvaire, the campaign sought to be an “immersive and shareable experience” for its consumers, and we think it definitely managed to achieve just that. There’s no doubt about it: adidas’ Shoreditch based Studio London is a stroke of genius. The whole thing. If you haven’t already heard about (or signed up to) the initiative, the idea is that Londoners after some free sports classes can book in with the brand’s studio on Brick Lane. Described as a hangout space for workout warriors, the studio offers fitness classes, running sessions, nutritional workshops and more. 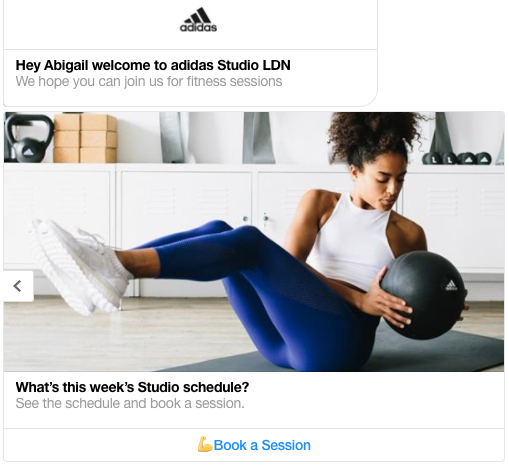 The only way people can view the studio’s upcoming schedule and book themselves in is by interacting with the adidas Facebook Messenger Chatbot, who can give you all the details you need. This presumably helps the brand curb oversubscribing, and prevents people taking advantage of too many free classes. It also helps marketers get to know the sort of classes each customer enjoys attending, and, of course, ensures its customers are engaging with them via social media. Pretty crafty way to get to know customers better, right? English department store Fortnum & Mason is known for its luxury hampers, sophisticated wines, delicately crafted loose leaf tea and … events. In fact, a whole section of its website is devoted to upcoming events it’ll be hosting—many of which taking place in-store. From the Glenfiddich Whiskey Distillery pop-up, where shoppers can don VR headsets to take a tour of the famous distillery where the whisky is made, to the Midnight Food Hall Feast (sold out, unfortunately), there’s always something going on. Most events listed on the site ask customers to register their interest, enabling a marketer to keep a record of this interaction whether the event is free or not. 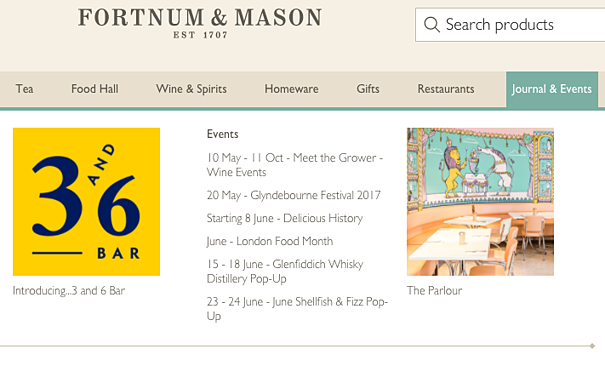 By advertising the hashtag #Fortnums at the very top of this events page, the store actively encourages those who do attend to share their experience on social media. Here’s an example of a snap taken at a talk by the iconic photographer David Bailey about his Fortnum's window installation. Ever seen or heard of a beauty and brows drive-thru in the UK? Now you have. As festival goers plod into Somerset traffic jams for Glastonbury this week they will be greeted by GlastonBrow: a drive-thru where beauticians and shop assistants from Benefit Cosmetics will be offering a menu of “brow-inspired gift options” as well as a plethora of freebies and “festival necessities”. According to the Evening Standard, those who share a picture of themselves with their drive-thru gift using the hashtag #BenefitBrows will “automatically be entered into competition to win a year’s supply of cult Benefit products”. No longer the reserve of coffee addicts, cafés today have become a versatile space for members of society to hang out in and make their own—whether that’s reading a book, writing a report or catching up with a friend. It’s no surprise then that, over the past few years, a number of trendy independent shops (usually found in east London) have started incorporating coffee bars into their store space, and now bigger names are following suit. One recent example comes from French Connection, which recently partnered up with Brwd Coffee to open a coffee shop above its store on Oxford Street. The Brwd website describes the coffee shop as a “beautiful, sleek space for us that invites you to hang out and take a break from shopping or work”. Open until 9pm, we’re sure it’ll be a huge hit with late night French Connection shoppers. DIY fashion brand Wool and the Gang hosts and oversees parties (known as WATG parties) where fellow knitters can meet up and get creative. Welcome to both beginners and seasoned knitters, the parties can take place at different customer’s houses, but will always be run by a WATG host who will ensure everyone’s having a great time. Just because an event or experience is offline, it doesn’t mean technology isn’t involved in the data-collecting process. To see where the idea of the “offline cookie” is headed, check out the plans in place for Farfetch’s Store of the Future concept. The concept has been described as an “augmented retail solution” bringing the online and offline worlds together. Farfetch’s CEO José Neves said: “The Store of the Future aims at providing the in-store experience of the future by giving visibility to retailers on what is happening in the store. According to Vogue, the first fashion businesses that will see the Store of the Future technologies deployed will be Browns and Thomas Browne. If you host an event, ask customers to sign up before attending (even if the event is free). An email address provides you with a powerful means of adding to their customer profile and targeting them in the future. Always have a hashtag for each event (or series of events), so that those who wish to share photos on social media can. Ask those who attend your event for feedback. You could do this by emailing them a short and succinct questionnaire. Before you go ahead with an event, think about how it will benefit your marketing strategy. For example, if you're a beauty brand, will it help you discover the number of customers that suffer from dry skin, and even the names of those who do? If you're a homewear brand, will it teach you whether or not it's worth running a campaign about pottery? Or will it simply boost brand awareness and/or increase footfall? Do you hope to make a few sales at the event itself?